The Spinions are a rowdy bunch who love to celebrate the good times – join them for a wild beach party amongst the palm trees and turquoise seas, and spin-ion your way to some sweet wins. This game received a lot of hype from Quickspin prior to its release, and we’re pleased to say it lived up to the expectations. It’s a Miami Spring Break celebration mixed with Universal Studios Minions and the result is a bright, colourful and unique game that’s all about fun, with multiple bonus features that really get the party started. Get on board with these quirky orange critters and embrace the Spinion way of life! 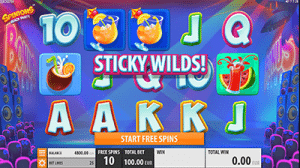 Slots Million – dedicated purely to the pokies, Slots Million offers over 1,800 online slot games from all of the world’s leading software developers. House of Jack Casino – a premium multi-provide casino, House of Jack offers the best games from Microgaming, BetSoft, Quickspin, and Play’n Go, all available for free or real money play. Welcome bonuses are available for new players, just follow our links to take advantage of some exclusive offers. These venues offer a safe, licensed space for Aussies to play pokies for real money, with secure deposits available using trusted payment methods like Visa, MasterCard, Neteller, Skrill, Paysafecard and direct bank transfers. Spinions is a five-reel, 25 payline video pokies game that’s available in instant-play mode with no downloads required. Quickspin software is incredibly user friendly, and as the paylines are fixed all you need to worry about is setting your desired bet amount. Using the ‘total bet’ button at the bottom of the reels, simply use the arrows or scroll up to select the value of your wager. Minimum bets start at $0.10 per spin, with a maximum bet allowed of $100.00 per spin, making it suitable for all bankrolls including high rollers. Wins pay from left to right and the game comes with a RTP of 96.5%. Wild symbol – the wild symbol is the Spinion (the little orange guy) which substitutes for all symbols to form a winning combination, except for the scatter. Scatter symbol – the scatter is the Bonus Beach Club symbol which can appear on reels one, three and five. An appearance of three or more scatters triggers the free spins bonus. Sticky wild re-spin – when two or more Spinion wild symbols appear in a single spin, the sticky wild re-spin feature is triggered. This gives you a free spin with the current Spinion wilds held in place, with re-spins continuing until no new Spinion wilds appear. 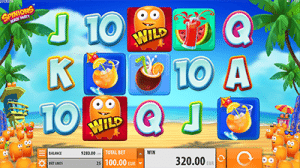 Beach club free spins – an appearance of three or more scatter symbols triggers 10 free spins, during which all Spinion wild symbols become sticky for the duration of the free spin rounds, opening up the potential for some truly massive wins. Free spins take you to a new nightclub themed screen where the reels adapt to a pumping nightlife and the Spinions really come to life. Spinions is everything you could want from an online pokies game – there’s fun animation, a unique theme and plenty of bonus features. The soundtrack doesn’t quite match up with the game theme somehow, but you can customise the settings to eliminate the sound. Other than that this is a premium game that we highly recommend trying and is a perfect example of Quickspin software. This one’s for the party animals! Quickspin's impressive pokies catalogue has grown by one with the June 2018 release of Dwarfs Gone Wild.